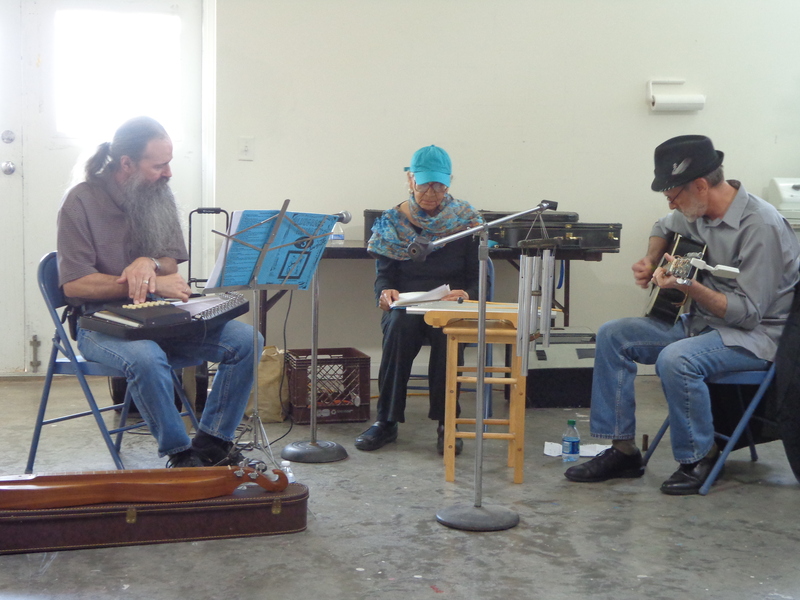 On a late Saturday afternoon in May, a poet and two musicians explored the possibilities—in an eclectic exchange of words and music genres, including world beat, blues, country and rock. Ike Erwin, native of Mayfield, Kentucky plays guitar, banjo, Appalachian dulcimer, autoharp, mandolin, harmonica, and he sings. Ike and Dave crossed each others’ paths as musicians way back when in one of the countless area jam sessions and went on to form the Ike Brothers Blues Band. You can see Ike on YouTube with Mad Dawg Mike Hinkle in a winning performance of “The Weight” during a Kentucky Opry competition several years ago. David (Dave) Phillips , guitarist, one of the ‘grandfathers’ of Paducahs’ underground music scene plays both solo and with bands, one of which went to the National Battle of Bands. He even played once for the Maharishi Mahesh Yogi. Also a visual artist, Davids’ work is in both private and public collections among them, the Chicago Peace Museum, Yeiser Art Center and the Clara M. Eagle Gallery at Murray State University. Kay S. Lindsey, poet (originally a painter), native of Washington, D.C., enjoys collaborating with artists in other disciplines, sculptors, musicians, printmakers, photographers, book artists, a metalsmith and ceramist among them. Current collaborations in progress are with cellist, Jodi Beder and Ike Irwin, bookbinder/musician. Her poem “Mad for Kites,” a recent collaboration with artist, Alonzo Davis, was on exhibit in late 2012 at Maiden Alley Cinema, Paducah, Kentucky. Ancestral roots extend to the Blue Ridge Mountains of Virginia.